ECU Joondalup have this morning appointed Dale McCulloch as their new coach, after Salv Todaro’s departure from the position two weeks ago. The 31-year-old midfielder has been skipper at the club for a number of years and is delighted to have taken up a new challenge. “Not many people get a chance to coach the team they love, and I feel privileged to get the chance,” McCulloch told the ECU web site. ECU Joondalup President Steve Wheatley believes McCulloch is an ideal choice. “Dale has been a part of our club for a number of the years, and he is a leader, and I know he will be doing everything he can to turn our season around,” said Wheatley. A drop in form as seen ECU slump from fourth spot to 11th at the moment and McCulloch is looking to turn the form around sooner rather than later. “Our form of late has been poor, and I have explained to the players that what I expect from now on,” explained McCulloch. The transfer deadline is only one week away, but McCulloch is happy with the squad he has, and he hopes he isn’t needed. “Every squad in the league could be strengthened, but I want to get more out of the players I already have, because I believe we have a good squad, but we have not been playing to our potential,” said McCulloch. 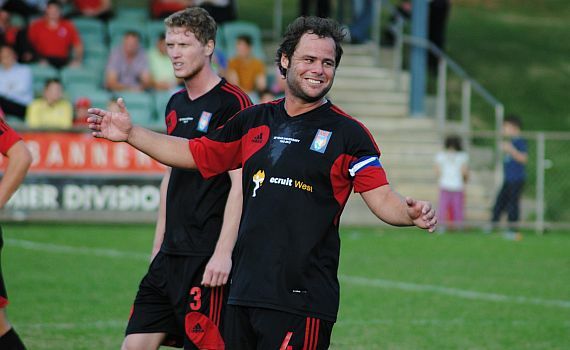 In other appointments, Willie McNally is the new ECU Joondalup reserves Coach, and Criag Pickles is the new team manager.